This Sunday I’m beginning a new sermon series on “Live by God’s Word.” The first sermon is “Change the Nation through God’s Word” from 2 Kings 23:1-7. As we celebrate our nation’s birthday we must remember that it was founded on the Bible. The Pilgrims and Puritans were driven to America with the Biblical concept that every believer is a priest (1 Peter 2:9). That concept formed the basis for their government (democracy) which in turn became our nation’s foundation. The revivals that swept our land gave the colonies a sense of unity that led to the Revolutionary War. The Presidents of the U.S. have acknowledged our debt to the Bible for shaping our character and for keeping us a free people. The further we move from the Bible the more likely we are to lose that freedom. Please come this Sunday as we see King Josiah read the Scripture to his nation and lead it to cast off that which goes against God’s word. Let’s promote the use of the Bible in society. This doesn’t mean we push our religion on the nation. It simply means we encourage the use of the very document that made us free and will help insure our freedom. Men, don’t forget our Prayer Breakfast Saturday at 7:00. I’ll be speaking on, “How to Be Free” from John 8:31-36. Have a happy Fourth of July! Join us for our parade on Fulton if you can! 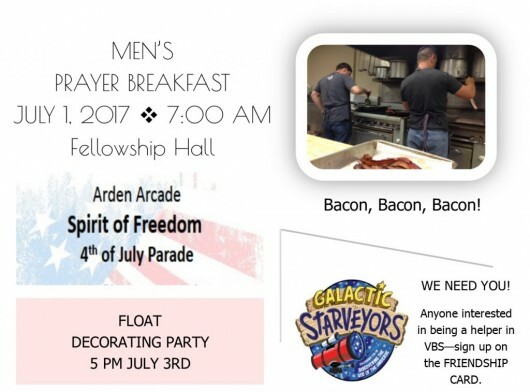 On July 3rd at 5PM we will be decorating the float the church is entering in this years Arden-Arcade 4th of July Parade. If you would like to help please contact Kim Horton (916) 248-1550. 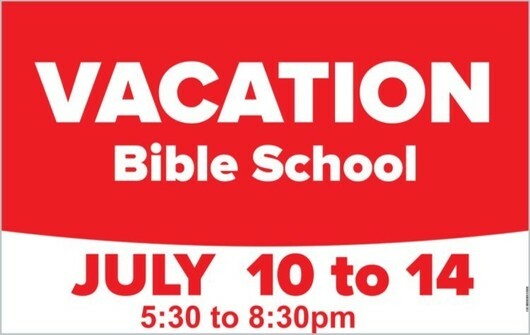 We will meet in the parking lot beside the church office. The July 4th parade is in a few days. If you would like to walk in the Parade, ride in the Float or help at the booth in the park please meet at the church at 8:00 am to assemble for the parade. If you would like to help fill balloons for the parade, meet at the church at 7:00 am. Update ❤️ I'm so thankful for Such a sweet time today at the orphanage (House Of Grace). These children are some of the most loving babies I have ever met. They all have my heart. It's going to be hard to leave at the end of the week. Carlos Rossy Montoya for their love, dedication and vision for this ministry and the people here in Mexico.